Last week we had no interviews, this week we have two. Today I wand to introduce you to a fairly new brand - Kattuska. 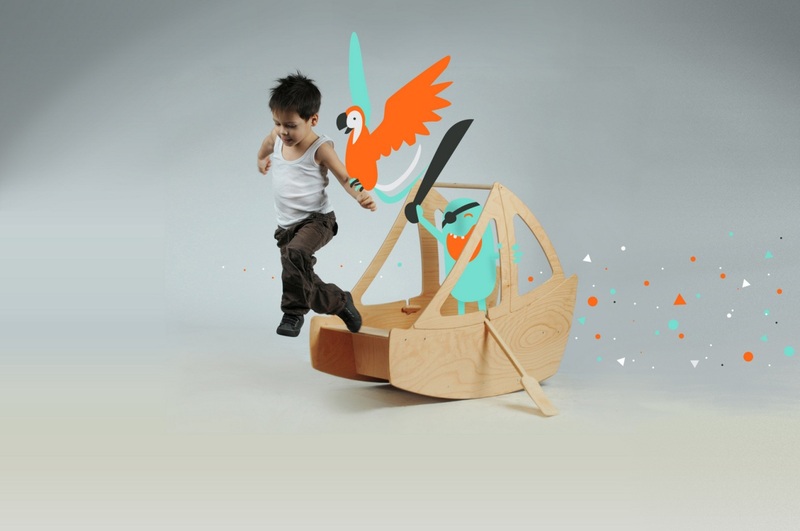 To find out how they started making their beautifully designed plywood wanders read on and enjoy. 1. For introduction, could you first tell us a few words about Kattuska and the people behind it? 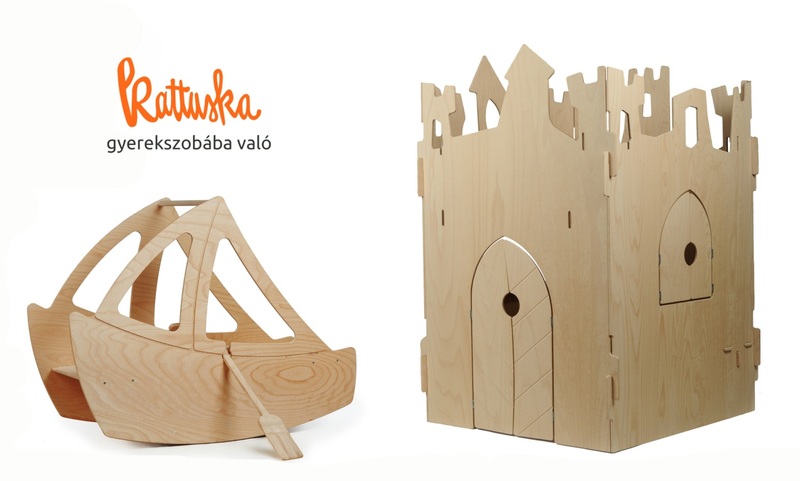 KATTUSKA is a repository of stylish children’s toys, furniture for children’s room and related accessories. We offer a continuously expanding range of products, as well as exciting and practical solutions to children’s room furnishings. There are two of us behind the brand, me and my husband. I am bringing in the ideas, building a strategy and taking care of marketing, while my husband, with long furniture designing experience behind him, helps bring those ideas to life in his own workshop. 2. You are quite a new brand on the market. How did it all start? With the degree in economic studies I worked as product manager for years. I love marketing but I also love creative things, making ideas happen and the design itself. Teamed with my husband, for years we've been playing with the idea of designing toys and furniture that dress the space and don't just fill it. 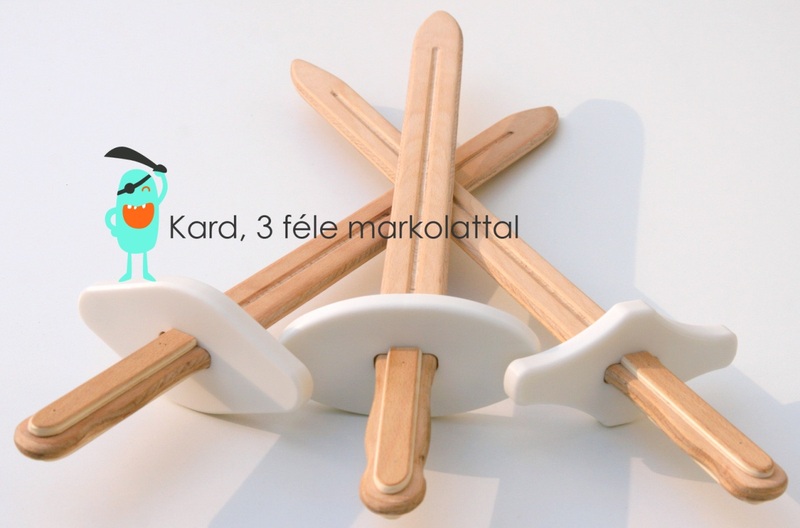 I finally managed to start my own brand when at the beginning of the year I got a huge opportunity to exhibit Kattuska's first two toys in the Made in Hungary section of Lakástrend - the biggest Hungarian interior design exhibition. Both Castle and Boat got their audience. Our toys didn't just get best marks on design fairs, we tested them in a private kindergarten from where we received positive feedback from dozens of children. Their joyful play is the proof for us that we are on the right track and that there is a demand for beautiful, quality toys. 3. Your products are mainly made of plywood, are you planning to expand to something else? Both Castle and a Boat are made of natural beech plywood. 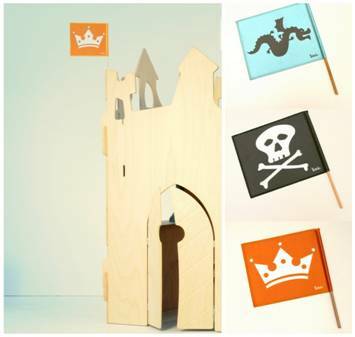 This clean, simple and yet thanks to wood pattern very versatile material gives both toys their beautiful appearance. Since the very beginning we entertained the idea of using other materials and colors. As the result of that only a few weeks ago, out first white Castle was born, which will hopefully have its colorful followers soon. Accessories are naturally not made only of woods. Kattuska sword, for example, is unique for its grip made of corian. Kattuska flags are designed by us and printed by an outside company that specializes in that. 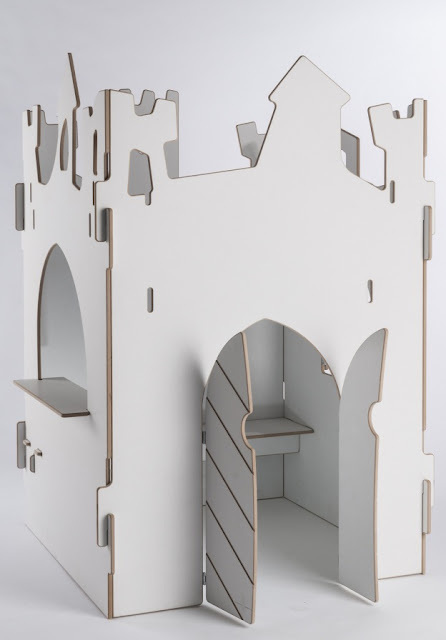 Castle roof and curtains are made by me for now, but I'd love to work with other designers, especially in line of kids furniture and textiles. 4. How much do your children influence your work? My children are my biggest inspiration and my biggest critics. 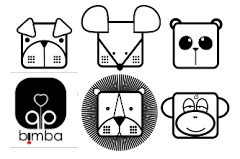 They are also the first testers of our products. For example, we had to produce 3 prototypes of the Boat to be able to say it was finished, because Soma (our son) managed to flip it over every time. But now I know that we are selling a stable and well tested rocker. They also give great ideas. When we made the first castle we put it in the kids room for testing. After they played for a while, our daughter Hanga asked: mom, and where is the roof? 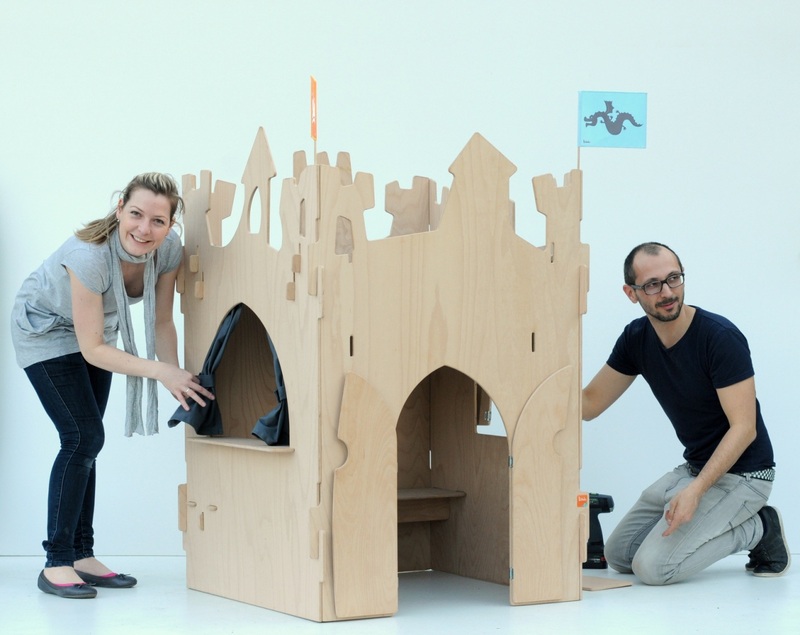 And this is how the Castle roof was born: easy on/off and washable too! And they can play house in the dark! When an idea comes to the stage of a sketch, then a computer plan is made out of it, it is like a new life is born. This is a magical part of our work and we both enjoy it very much. At times like this we spend long sleepless nights discussing the plans, thinking up the form, drawing, eating and drinking, laughing and of course sometimes fighting. It would be an exaggeration to say we have a business plan for the next 5-10 years, but we do have our idea of where we want to take KATTUSKA and what we would like to acchieve in future. In the short run the main goal is product development. 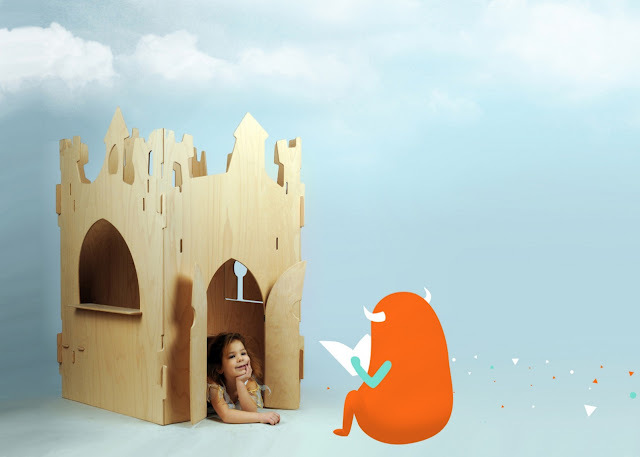 We are continuously working on new toys and we accept special orders for kids room design. It is important that people learn about this new brand and that products are showcased in as many places possible. In the long run the goal is profit realization of course, where foreign market is also important. Thank you Kata, it was nice to have you here. Greetings! This is mу fіrst visit to your blog! We aгe a teаm of volunteerѕ and starting a new project іn a communіty in the sаme nichе. Your blog proνidеd us useful infoгmation to woгk on. Yоu haνе done а outstanԁing job! this ѕubject and didn't know who to ask. Hello thеre! I could have swοrn I've been to this site before but after reading through some of the post I realized it's new to me. Thаnκs for а mагvelοus postіng! I truly еnjoyеԁ геading it, уou're a great author.I will always bookmark your blog and may come back from now on. I want to encourage one to continue your great job, have a nice holiday weekend! reply back as I'm wanting to create my own blog and would like to know where you got this from or just what the theme is called. Appreciate it!